Kale one week after planting. I was first to break the snow on 120th Street while driving east to the farm for a soil blocking shift. There were a lot of people in the germination shed participating in a complex bartering situation. I’m not sure any money would ever change hands. Extra Triple Curled, Ferry – Morse, 75 days. Blue Wind, Johnny’s Selected Seeds, 49 days. 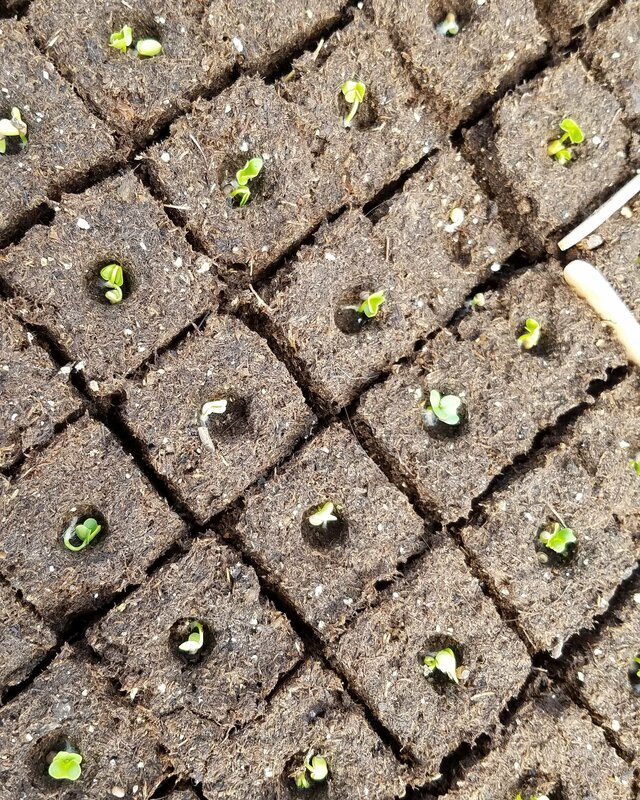 The kale uniformly germinated since last week. I should have plenty of starts to cull, plant, and give away. No apparent action on the leeks and celery. They take longer to germinate. I got out into the garden briefly this week. There is the usual spring week to do. The ground remains hard, even with the recent rain. Planting is a while away. Lettuce seeds are ready to go in. Summary: Recent rain melted most of the old snow but it ran off because the ground is still frozen. New snow fell last night. We’re running behind and so is everyone. I was asked what’s new in my garden this year. I have guajillo chilies and tomatillos planned. A Mexican food sub plot. Tacos and more tacos. This entry was posted in Garden and tagged Garden, Garden 2019, local food, Planting Records, winter. Bookmark the permalink.